Mapon has developed a new report which displays historical data about all vehicles of the fleet that were in a specific location and during a specific period of time. The territory and time period can be easily customized so this report can be used for various fleet data analysis. 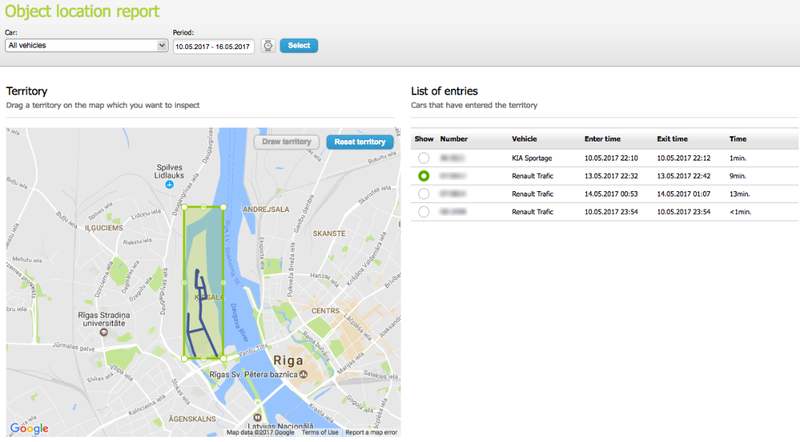 The solution was initially developed for Riga City Municipal Police and has many applications. The police needed a quick and easy solution that would allow them to find out whether their vehicles had done patrolling in specific areas. Another problem was the processing of citizen complaints about police vehicles in specific locations and time without having information about police vehicle license plate. Requirements for these problems lead to a new report in Mapon system which can be used to track down all vehicles that have been within a specific region in a specific time interval. The usage is as simple as drawing a region on a map, selecting a date/time range and reviewing which vehicles have visited this region during the specified time period. The same logic can be applied to other industries. For example, if your drivers have to visit specific areas and do visual examinations, you can easily check whether any vehicle has been in the location during a specific time interval. This can be also used to follow road quality and agriculture industry checks, road cleaning tasks and any other task that needs to be done regularly or irregularly. In addition to this specific report, Mapon GPS tracking platform also has an extendable geofencing functionality; alerts about entrance and exit of specific geofences customizable by the system users, speed limit violations within a geofence and many other useful features including powerful integration options with external systems via our API to create the perfect solution for your business needs (read more about our various integrations). One of our main priorities at Mapon is to focus on client needs and create the best possible solution for each and every one of them.